Their new album is called “Look Alive” and it comes out January 18th on Nettwerk Records. We’ve shared a couple of tracks and a few little snippets of information so far, but now we’re ready to get serious. We have a new song called “Look Alive” which is track 1 on the album Look Alive, The cover art for Look Alive was embroidered by a fabulous artist named Nikki Virbitsky. 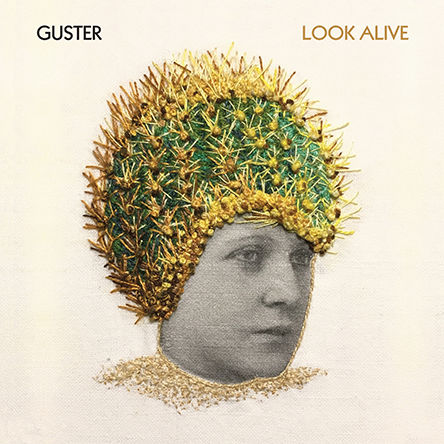 Given their fondness for populist precepts, Guster ought to find plenty of inspiration for their upcoming album, and given its prescient title Look Alive, one would imagine that the band’s in a generally upbeat mood. Word is that it was recorded in a vintage keyboard museum in Calgary, Alberta, and that despite the chilly temperatures, the mood was quite merry. It remains to be seen—and heard—how being set free in a building filled with archaic keyboards might have had a lingering impact on their new music, but given Guster’s generally upbeat antics, we’re guessing that they made the most of the opportunity. Perky piano and sizzling synth ought to temper the tableau. Look Alive is available for pre-order now, Standard Black Vinyl, and a Deluxe Clear Vinyl variant. The deluxe comes with a special fabric-wrapped hardcover book, exclusive embossed cover, and a 10 page layout with printed sleeve & band portraits. We’ve included a bonus track, “When You Go Quiet,” on physical copies to entice people to actually order them — but we need not harp on this. Guster fans have supported our music, shared our music, and encouraged our creativity from the beginning. It is an honor to present Look Alive to you guys. After 27 years, it’s an album that will be a major part of our legacy.